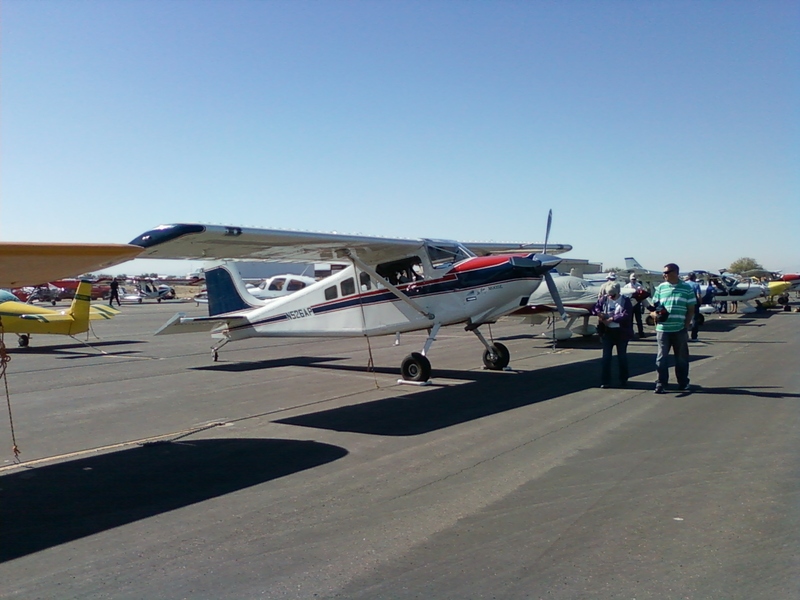 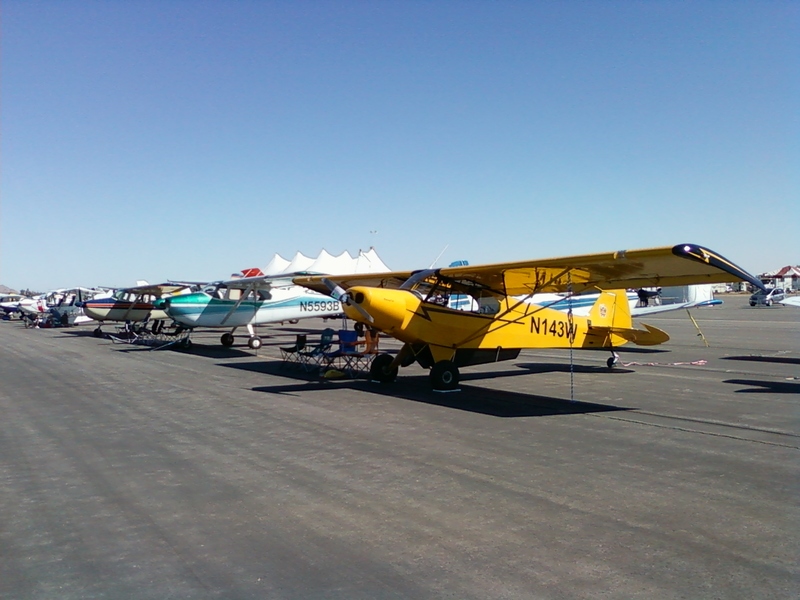 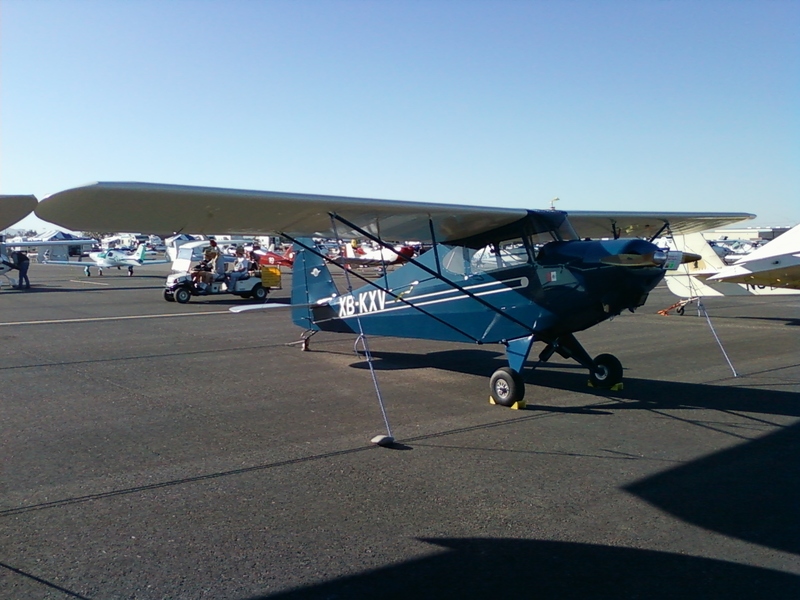 My SuperCub at the show. 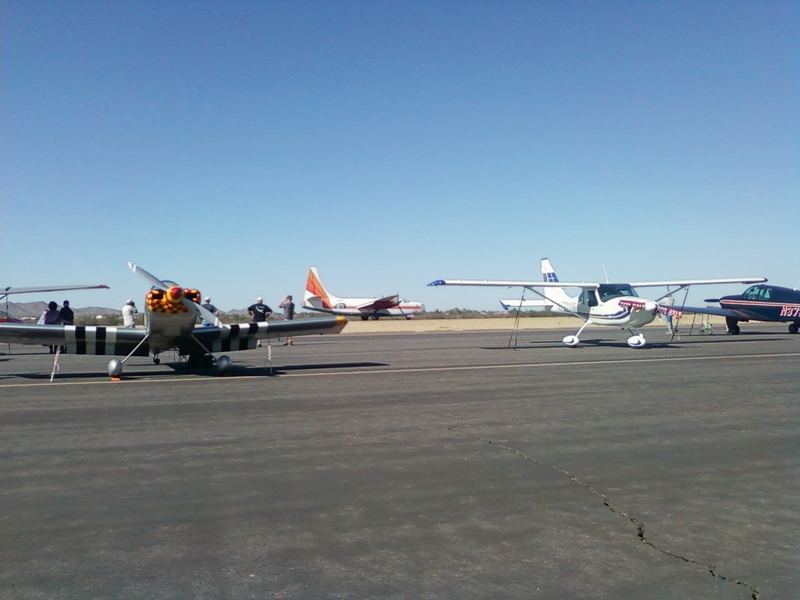 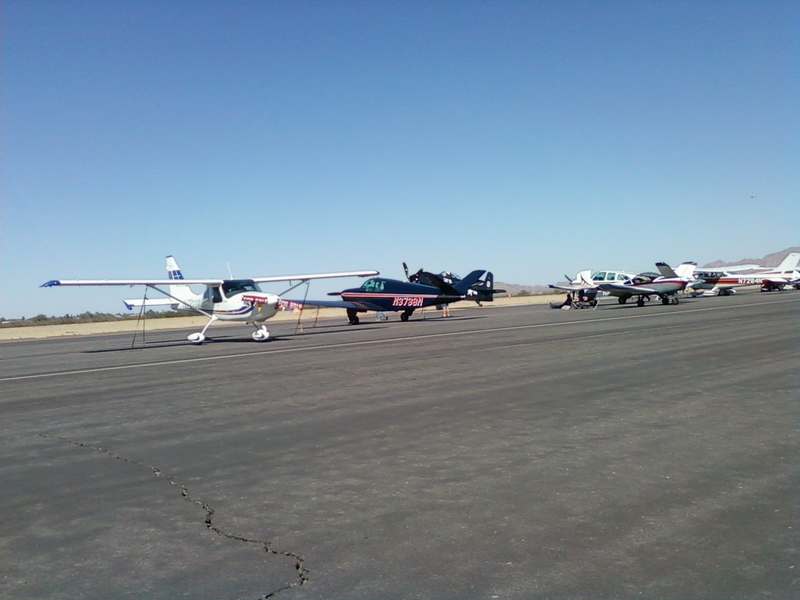 Lloyd's 182 and Randy's 172 Cessnas behind it. 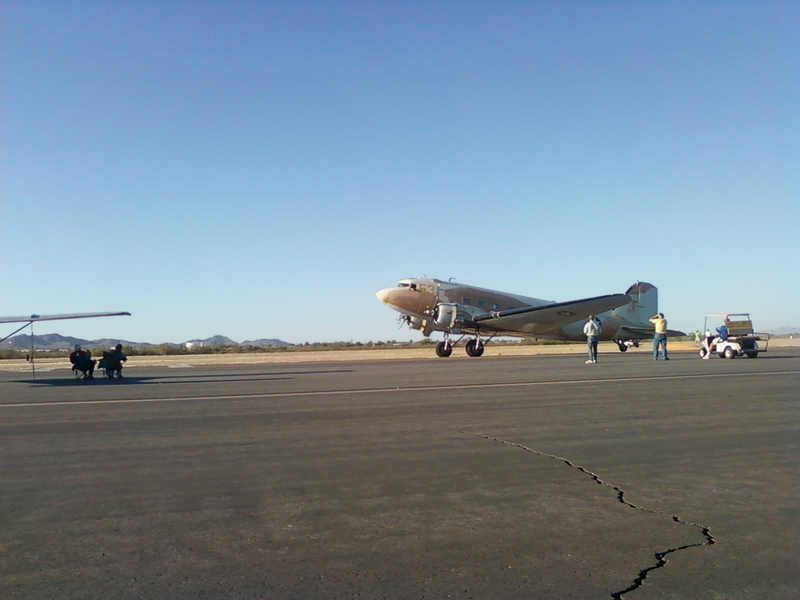 DC-3 on a fly by. 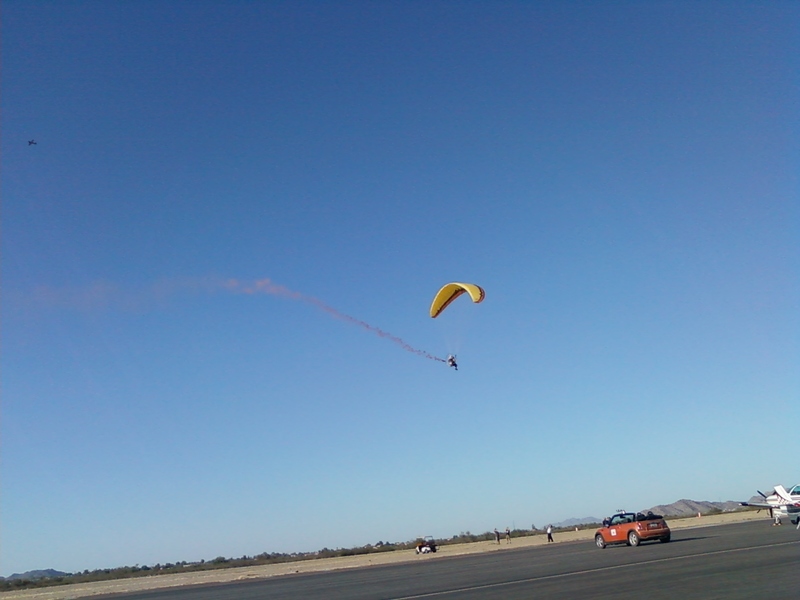 With the delay on my camera, I just about missed him. 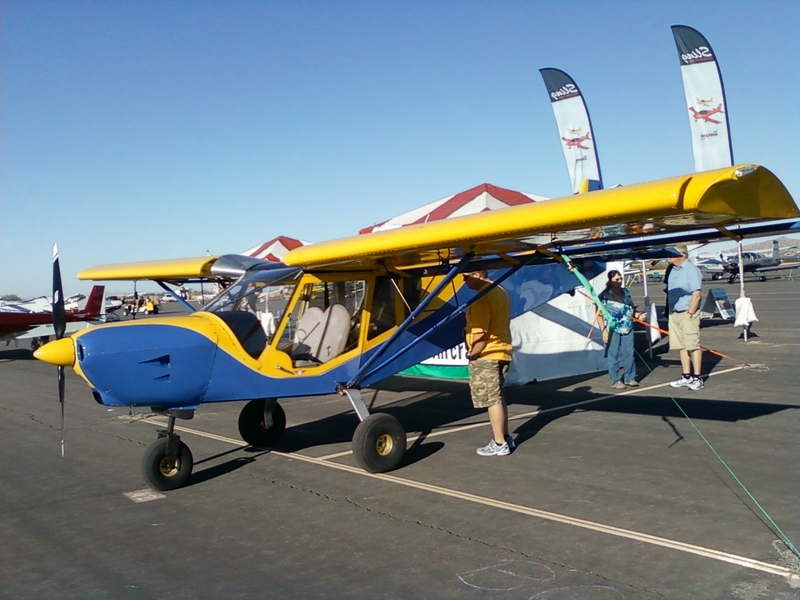 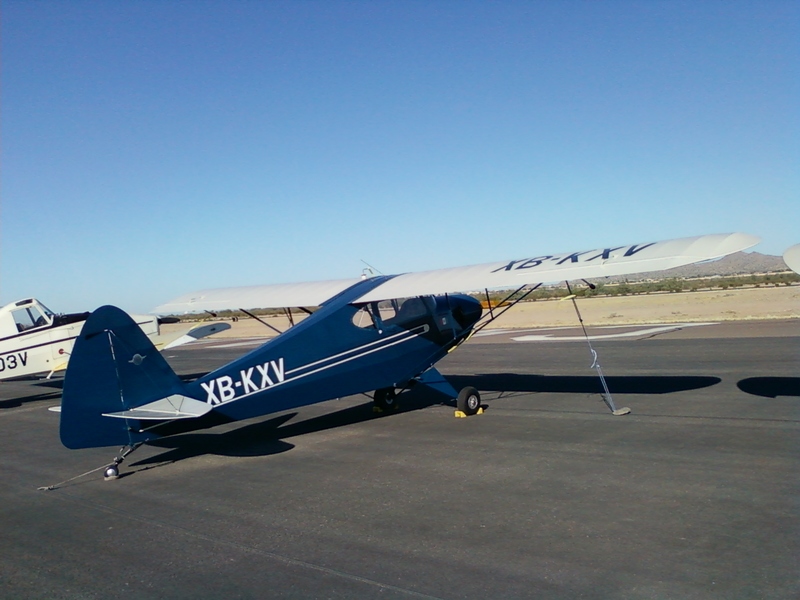 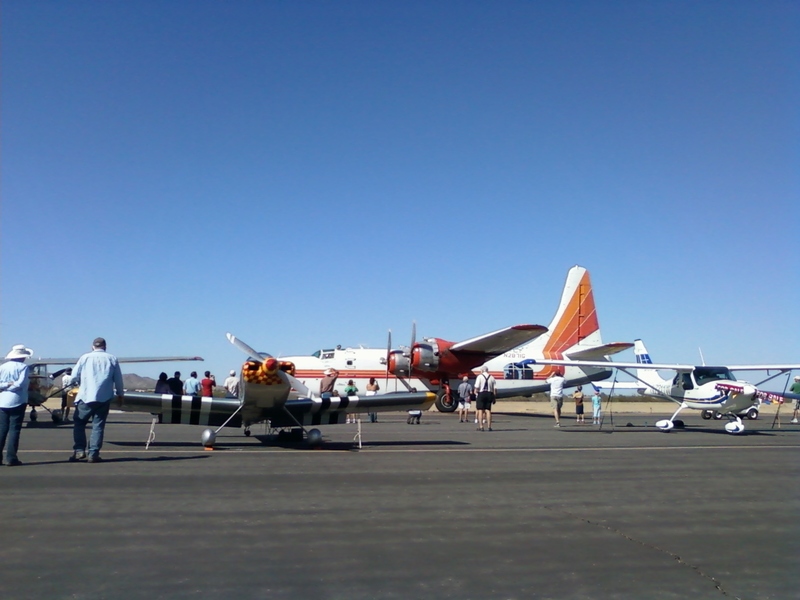 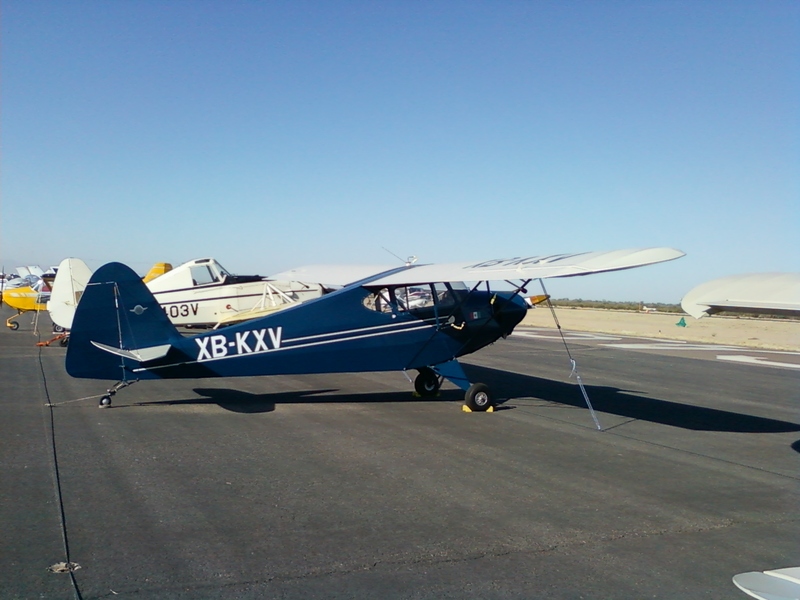 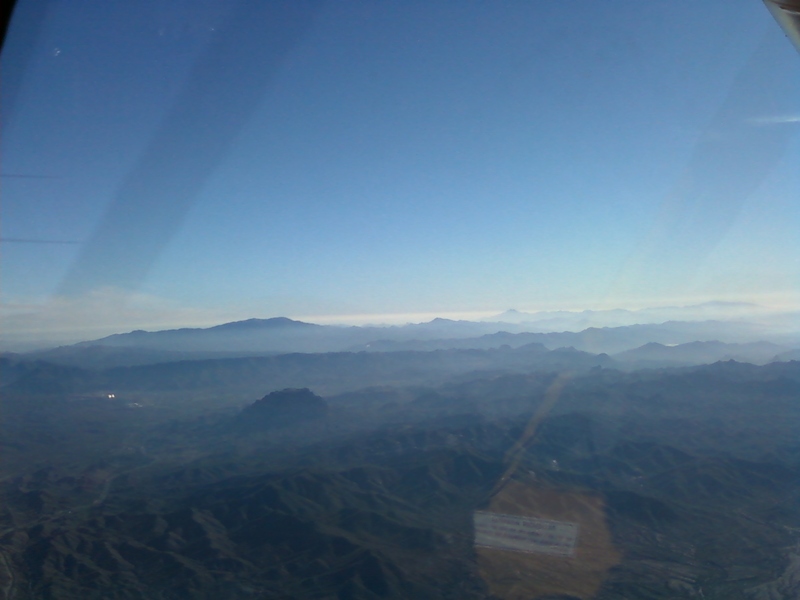 This Porterfield flew up from the Mexican Baja. 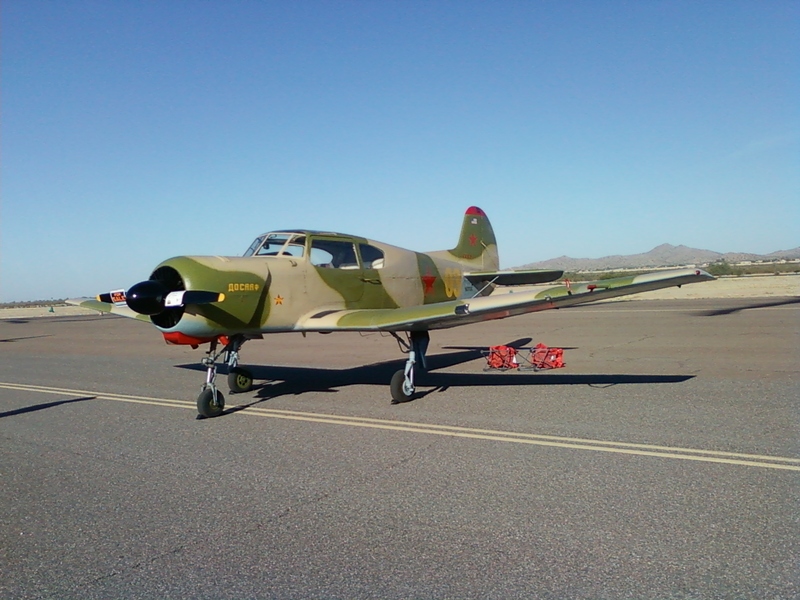 The owner had decades of intermittent work and 5 moves during the restoration. 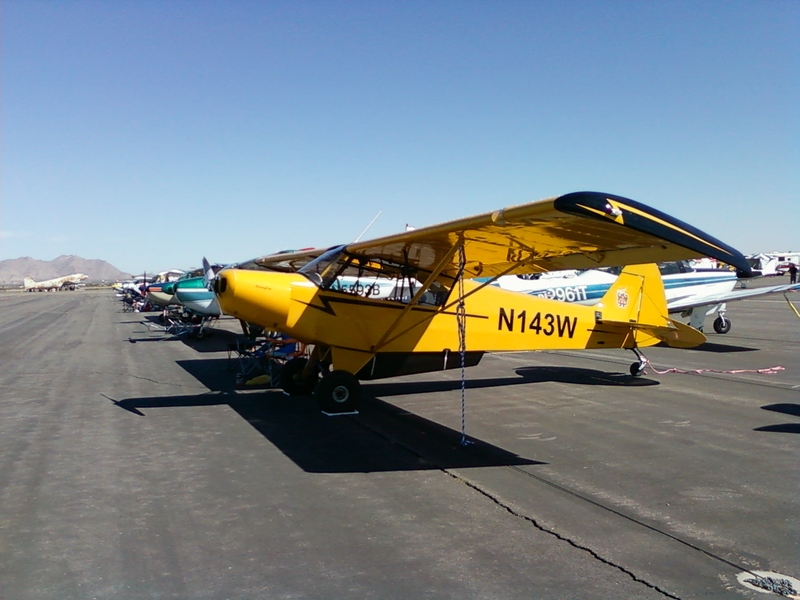 The Porterfield is so narrow it makes my Cub seem really roomy. 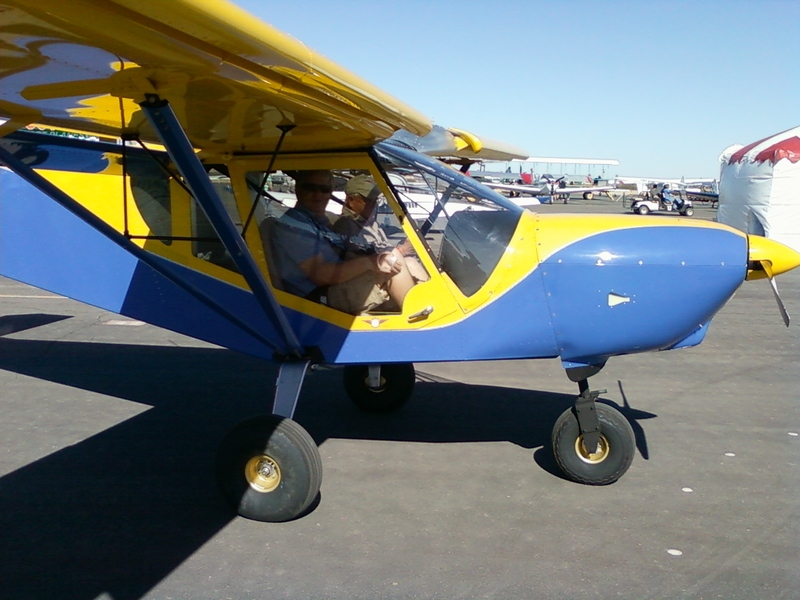 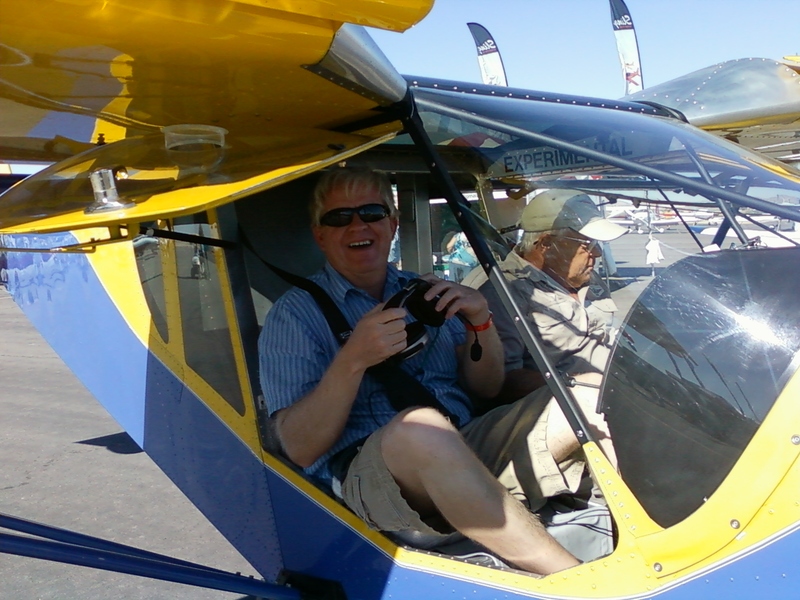 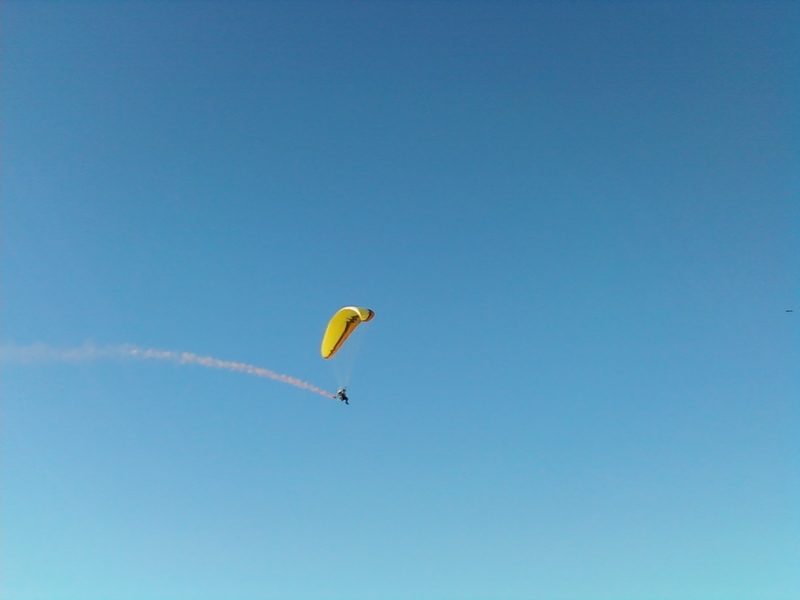 Thomas after riding in the showcase in the Zenith CH-750. 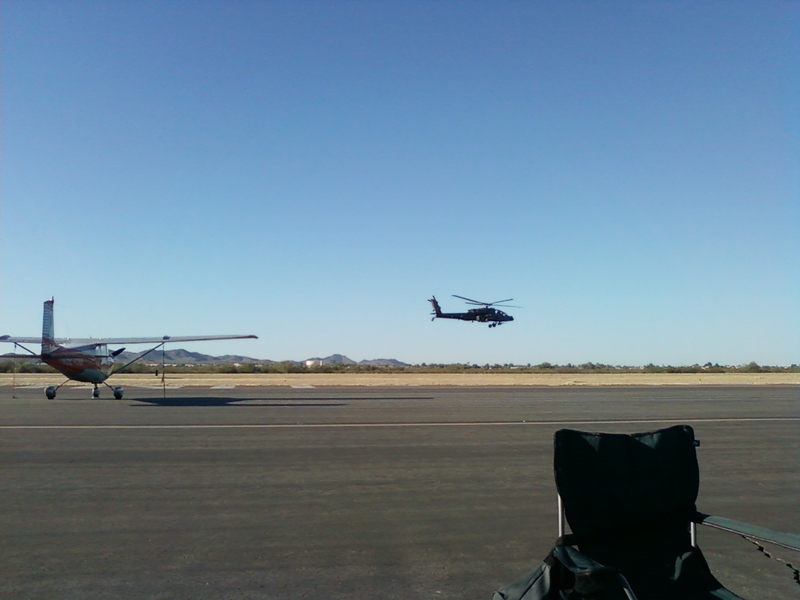 Thomas should have his own CH-750 done in time to fly to Copperstate next year. 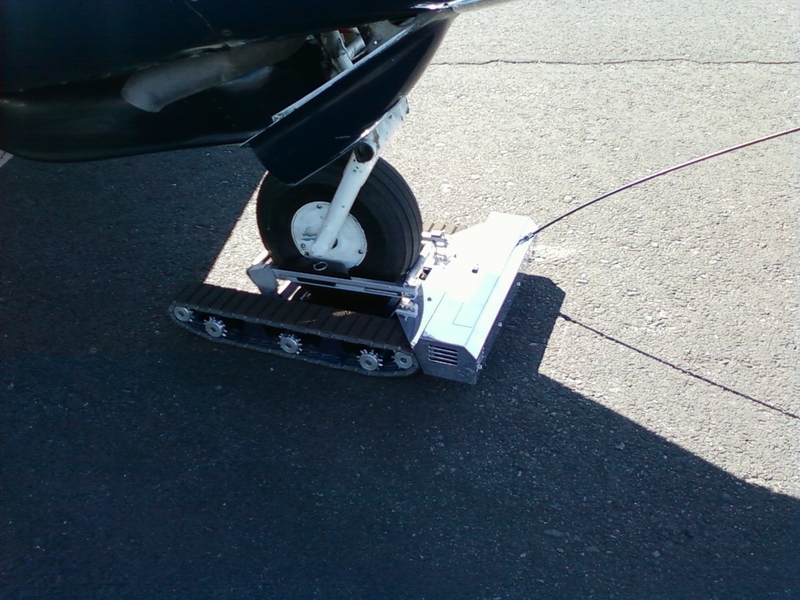 A remote control nosewheel tug. 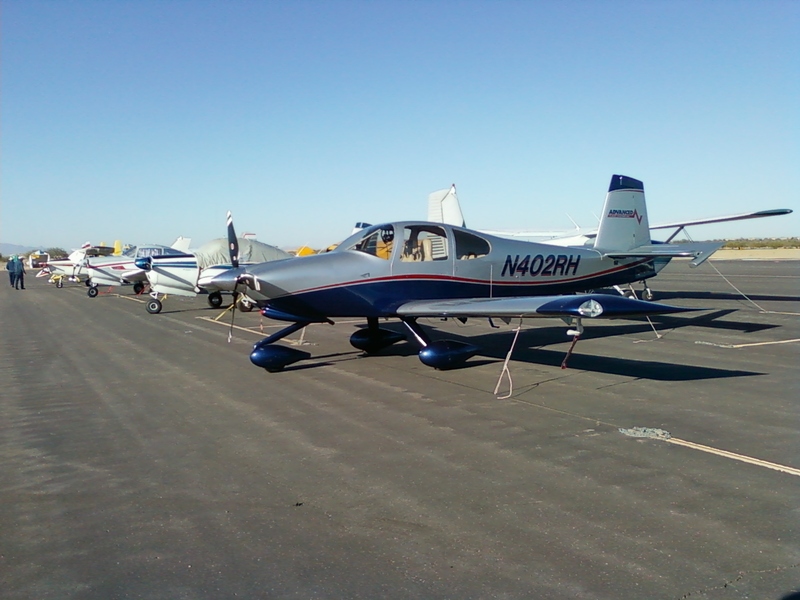 Only a few thousand $$. 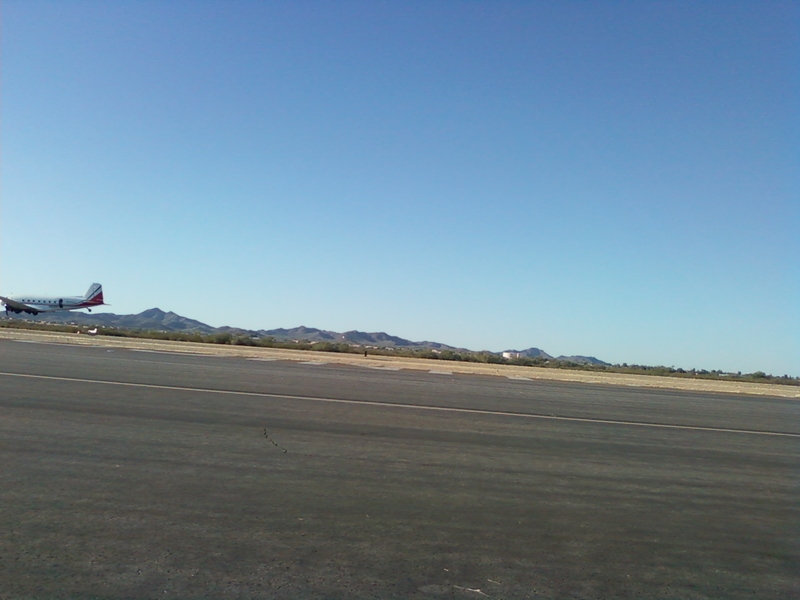 with him once he finally shut down. 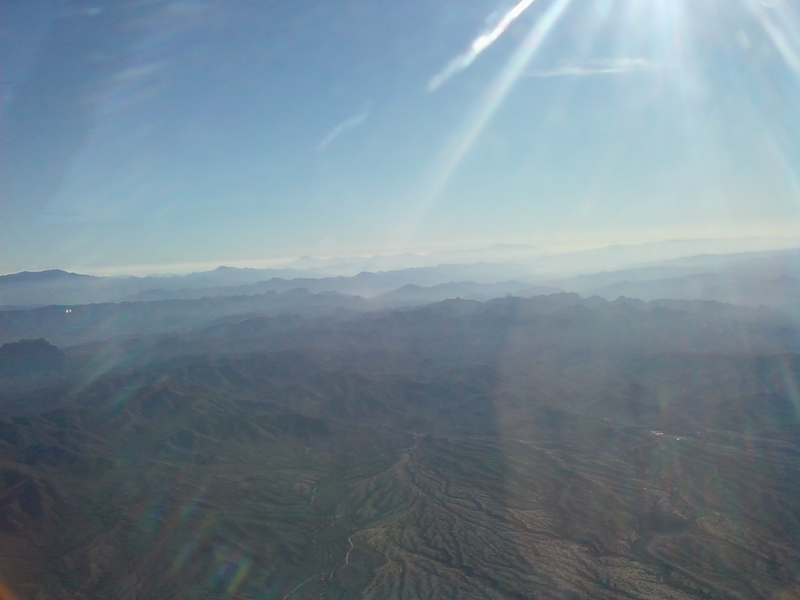 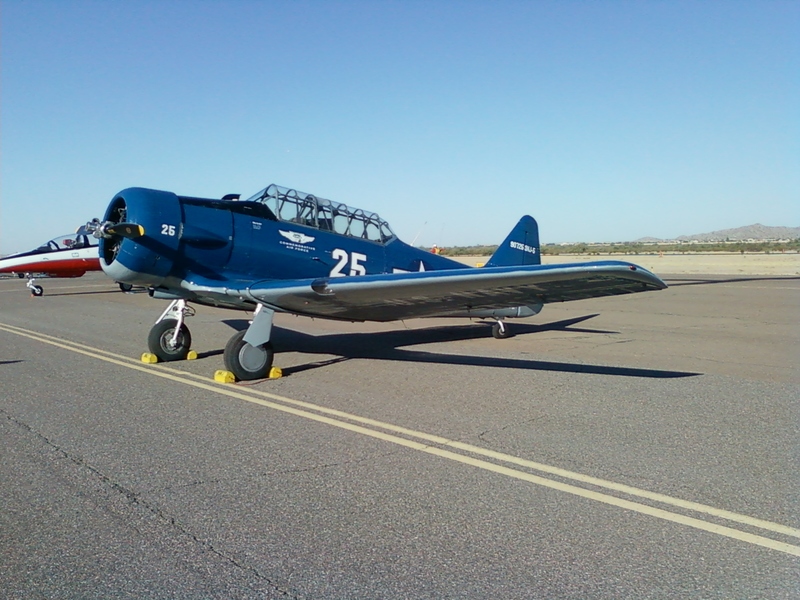 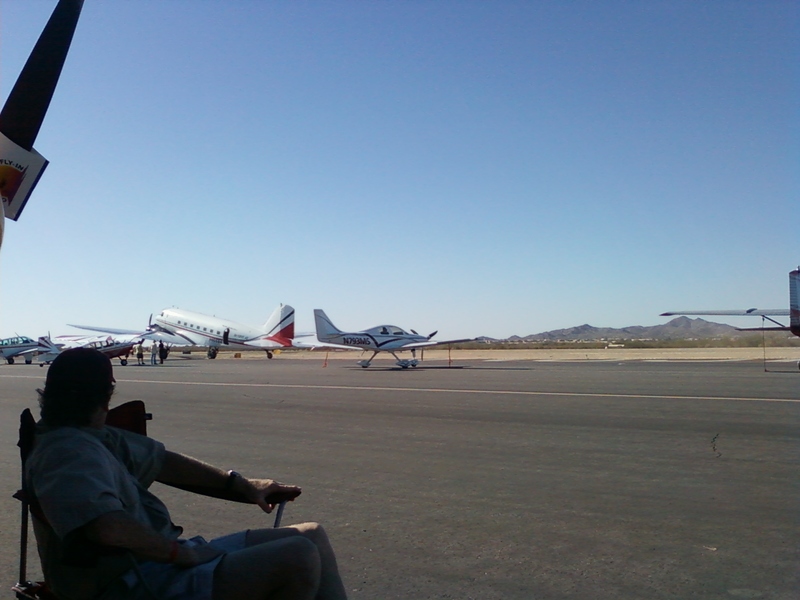 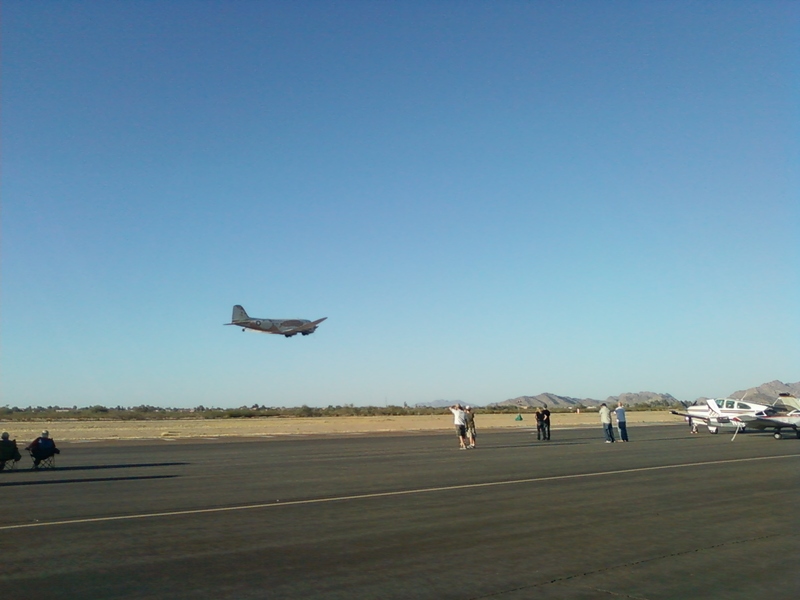 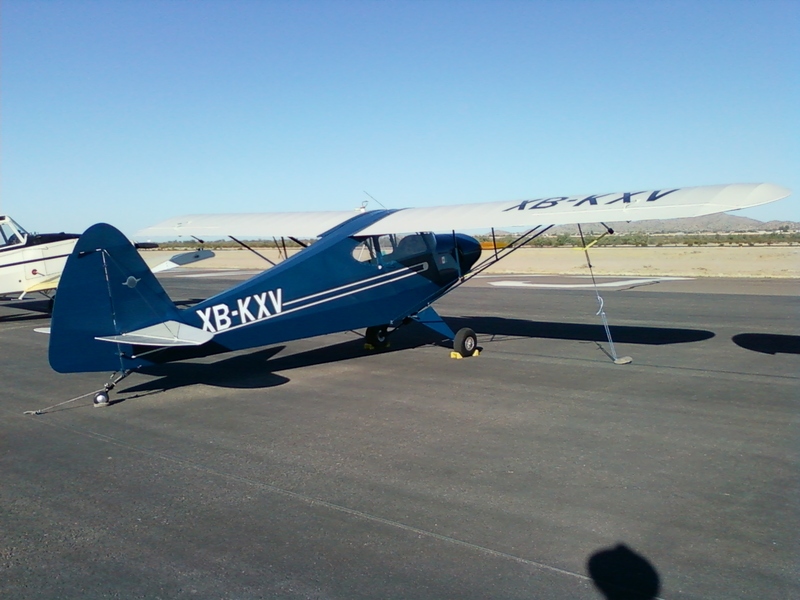 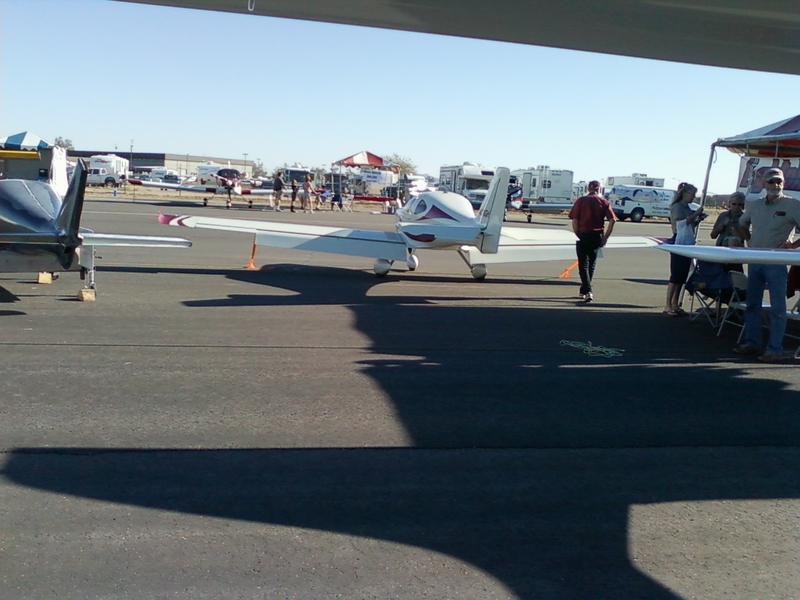 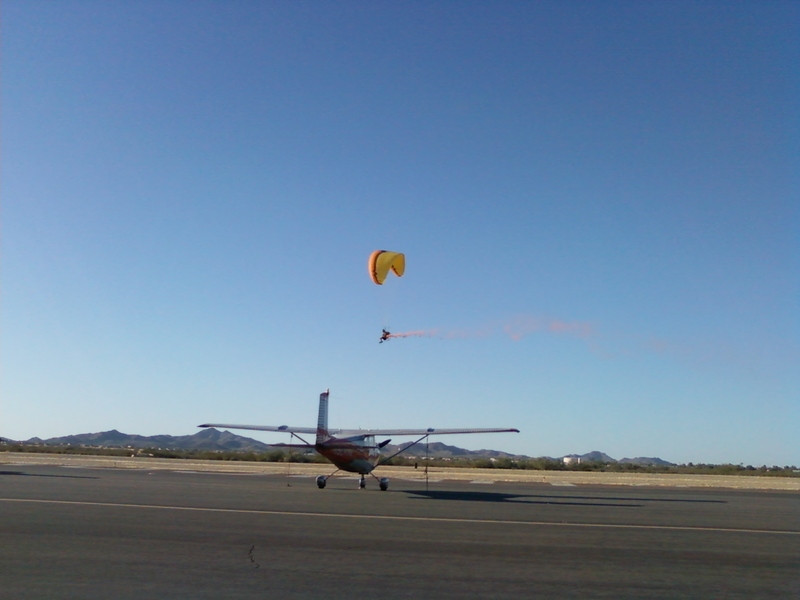 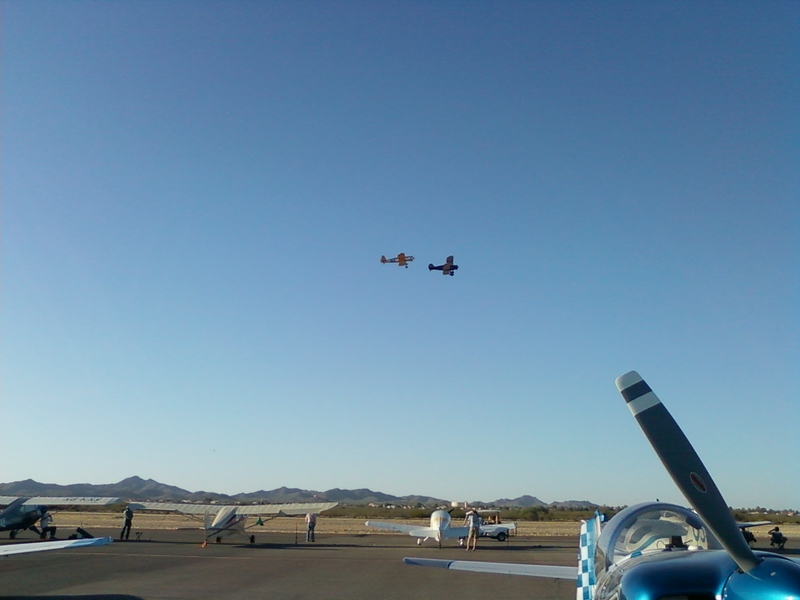 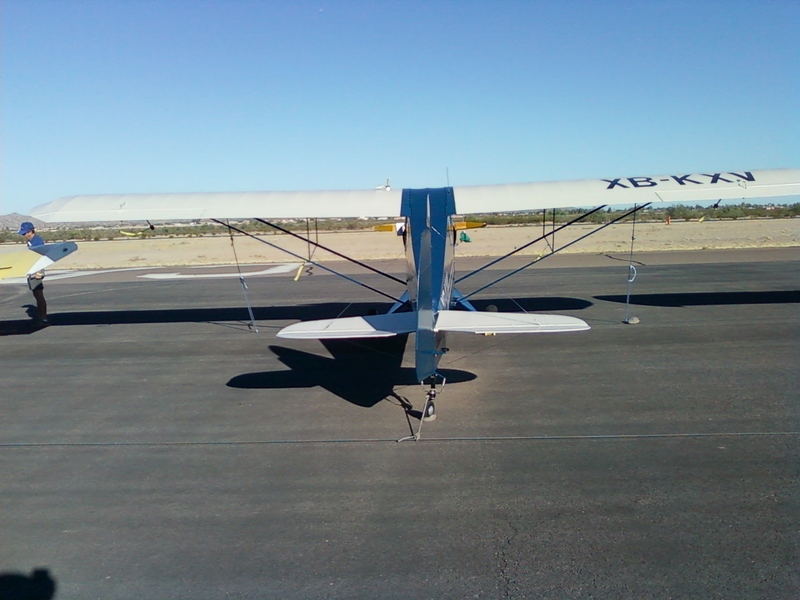 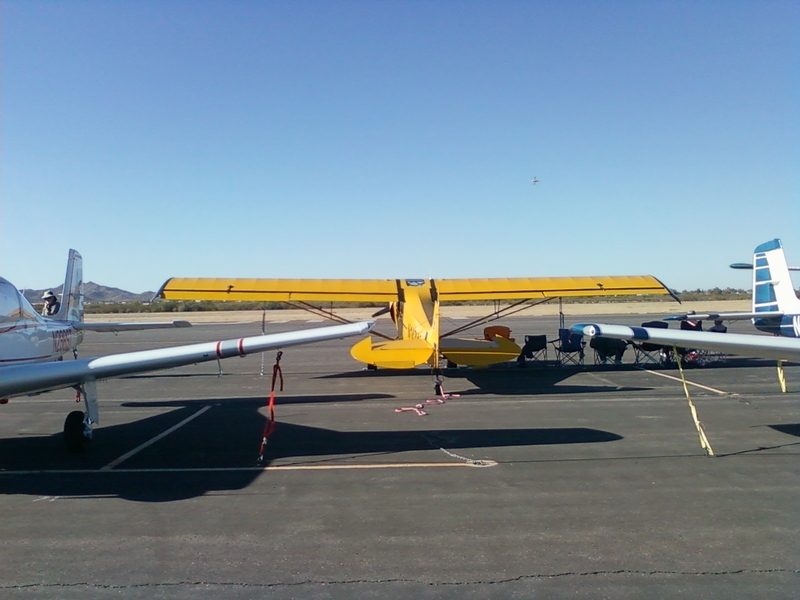 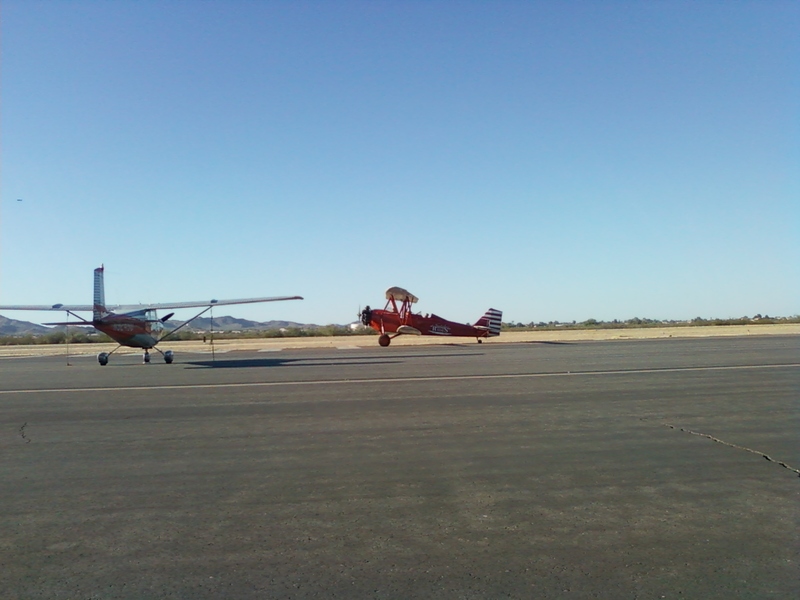 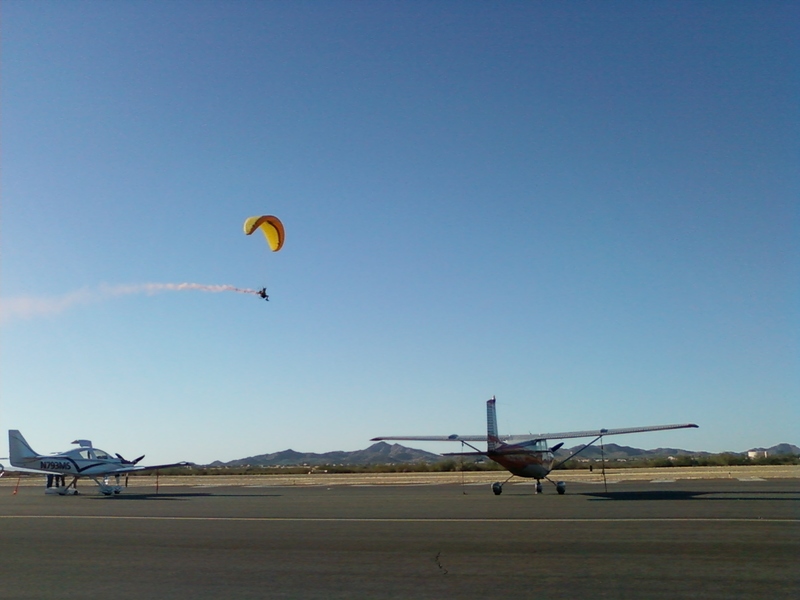 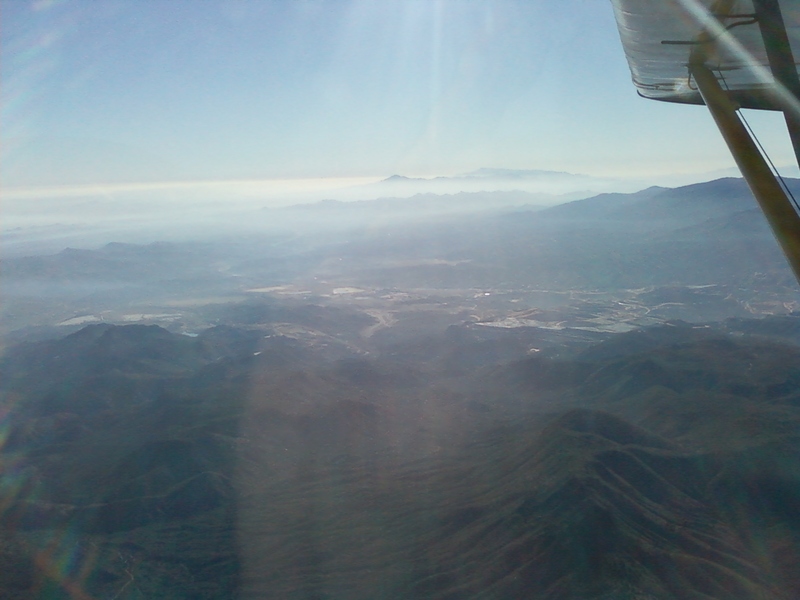 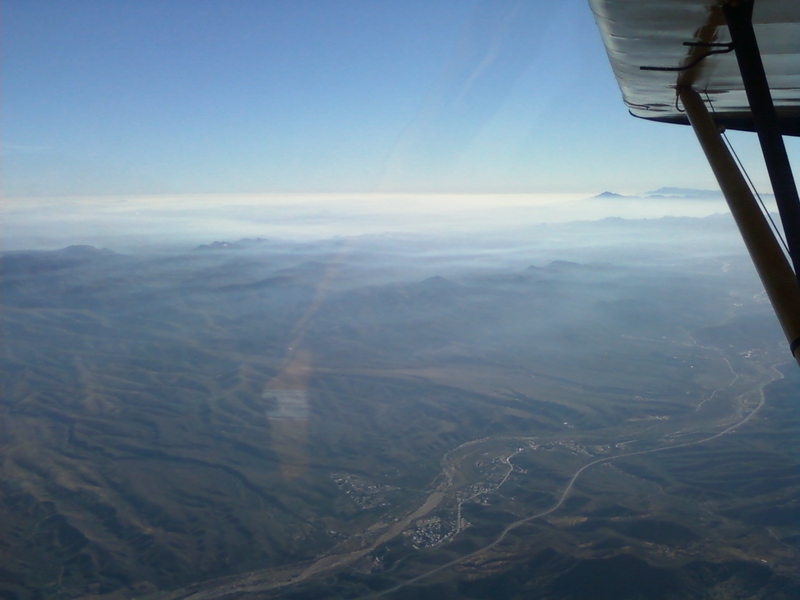 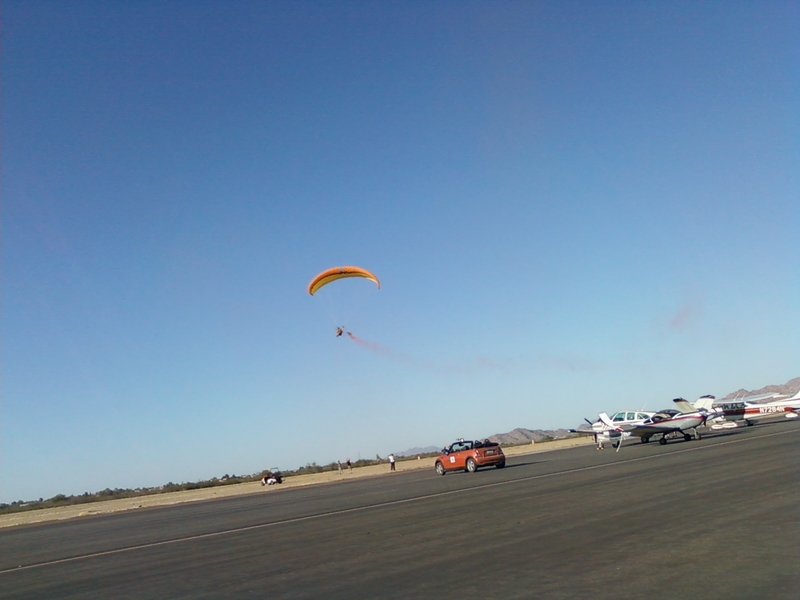 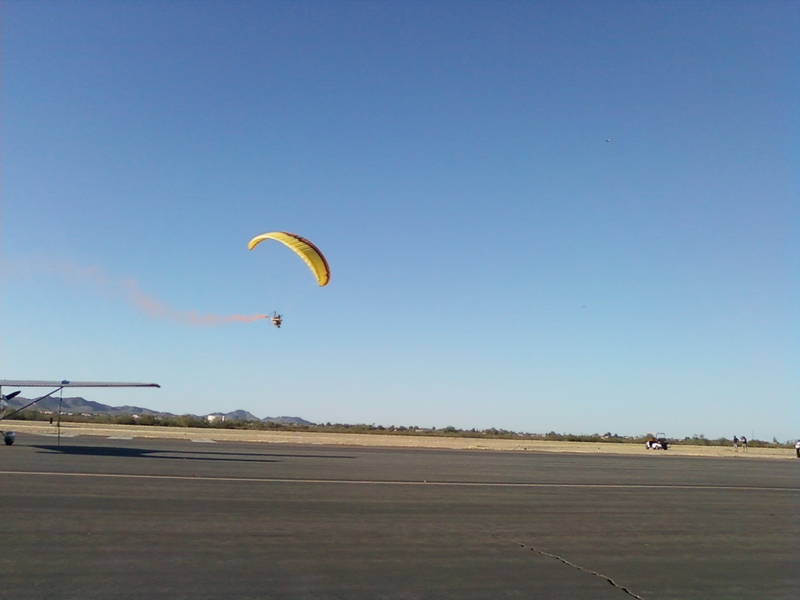 The Copperstate organizers weren't too happy with the pilot's lack of ability to follow simple instructions to" fly down the centerline of the runway". 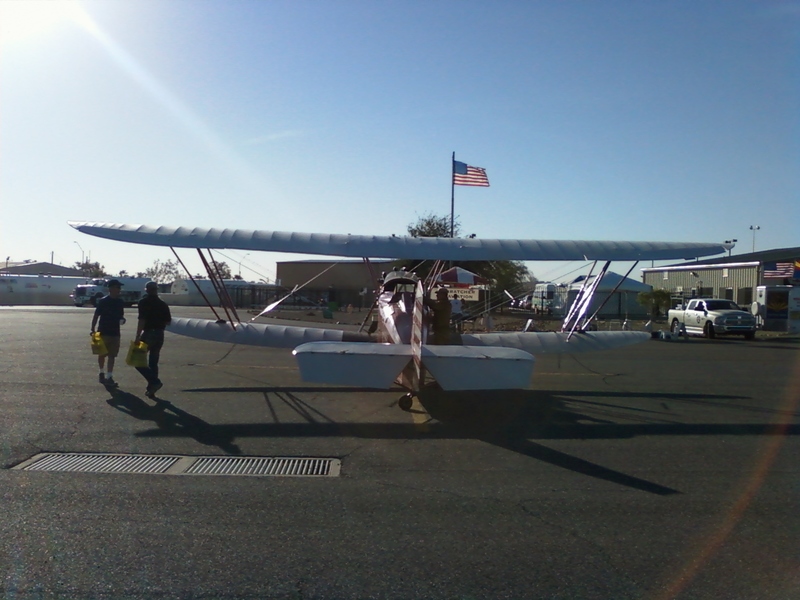 1929 New Standard Biplane was hopping rides throughout the fly-in. 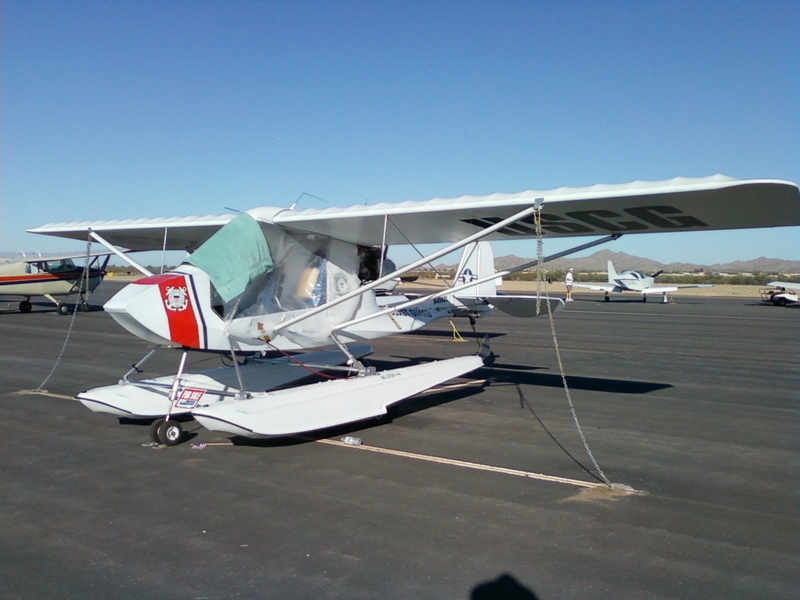 PBY-4. 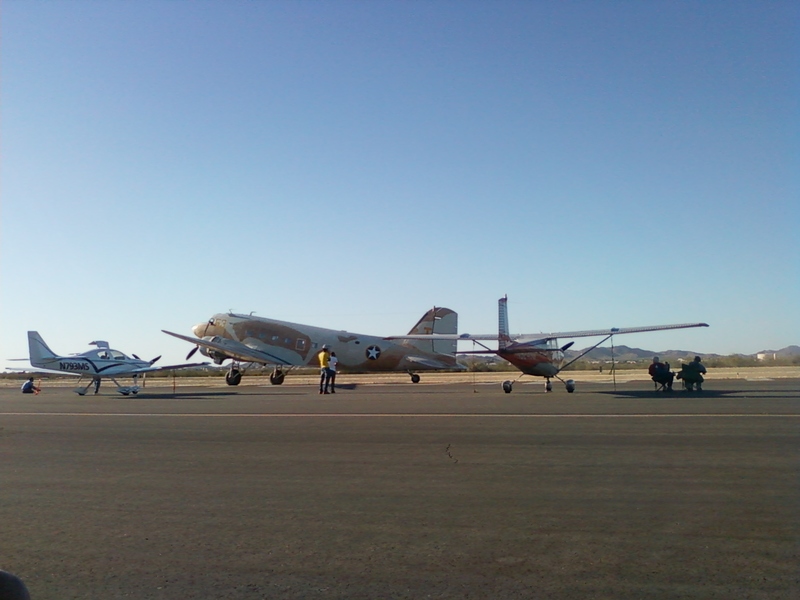 This was the Navy version of the B-24 used for submarine hunting. 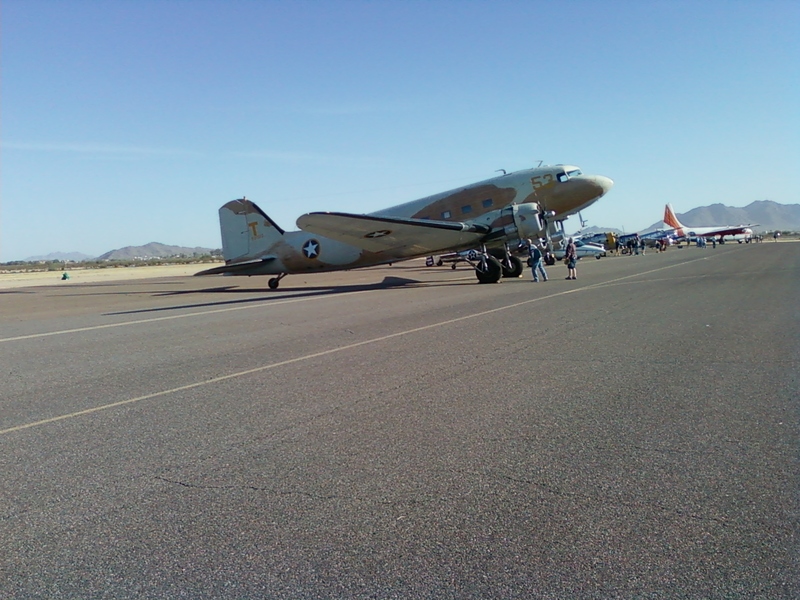 Another DC-3. 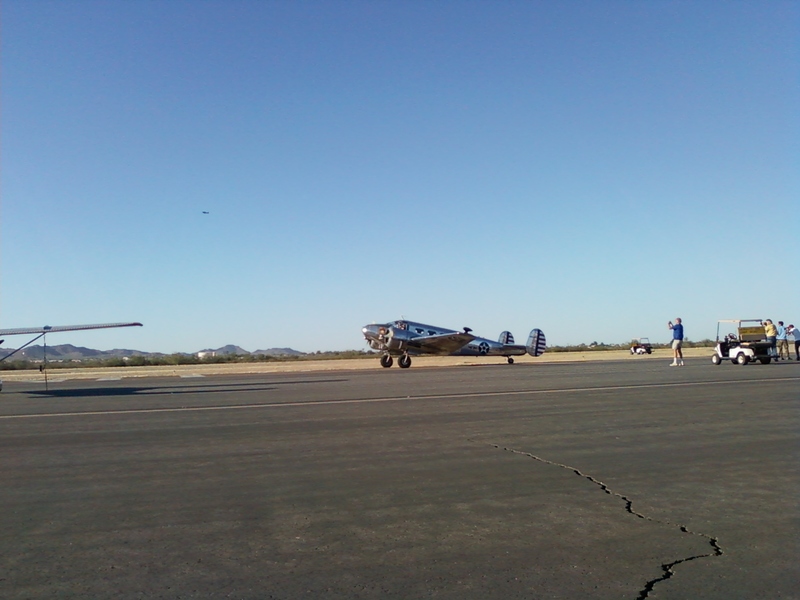 There were actually 3 DC-3s that either landed or did a fly by during the weekend. 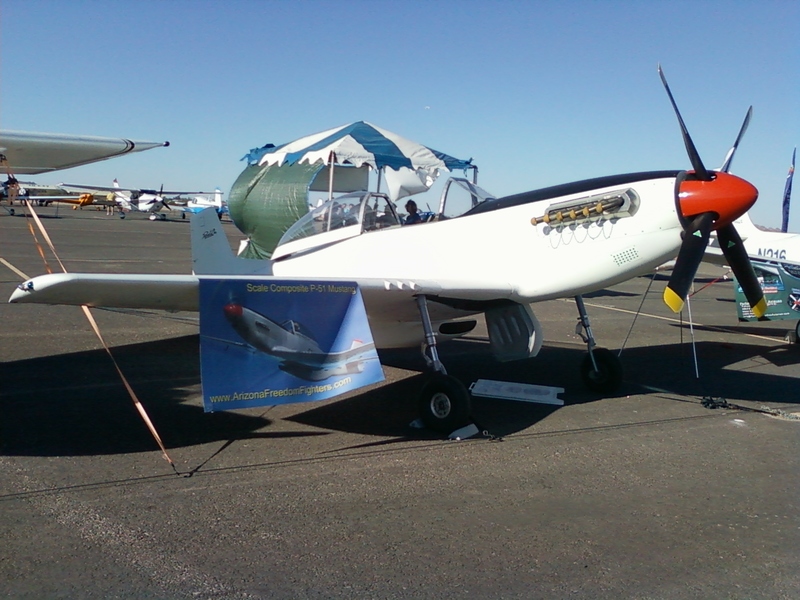 3/4 scale P-51 by Performance One Composites. 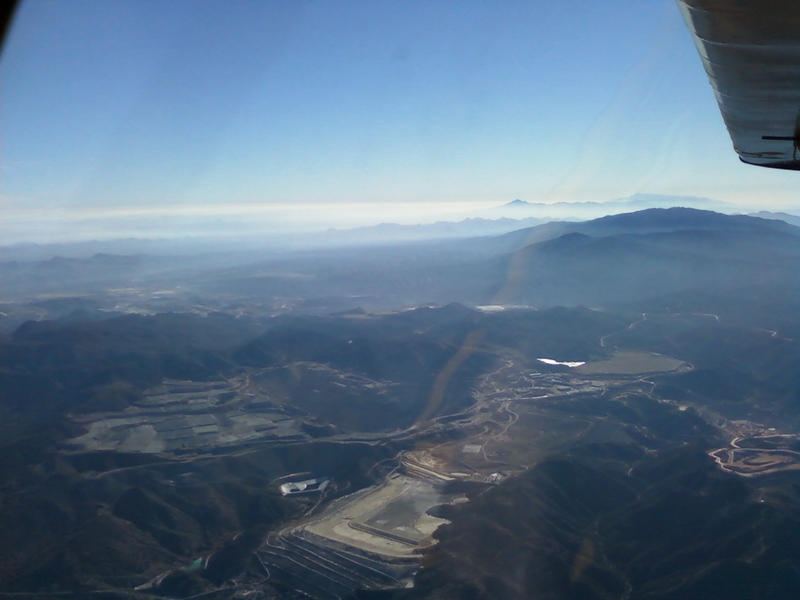 My buddy Lee works there. 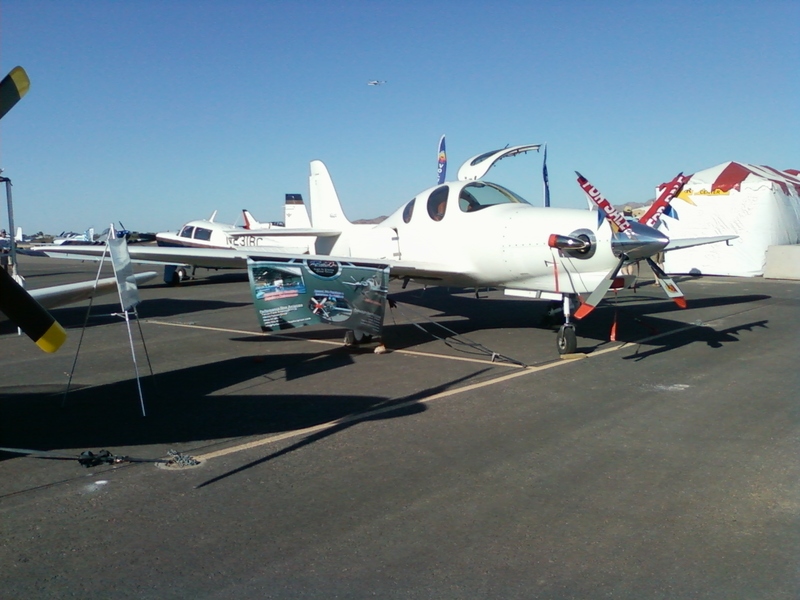 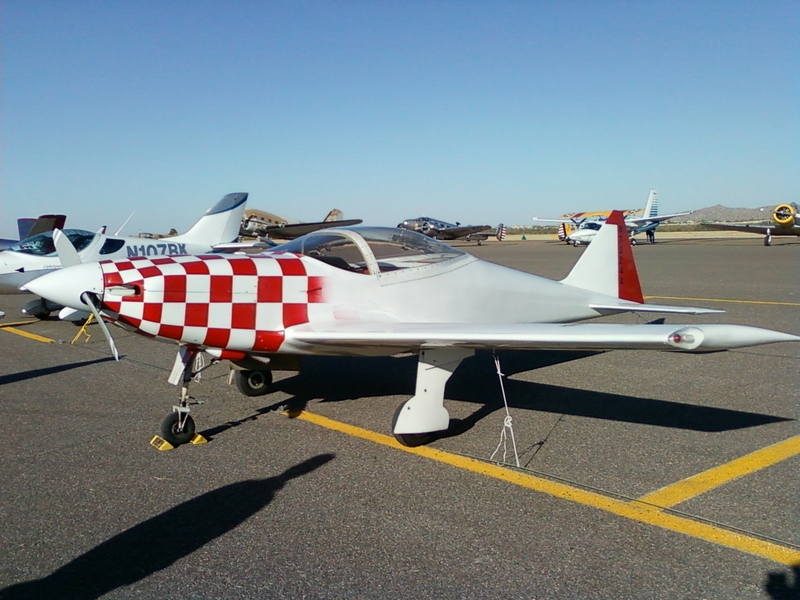 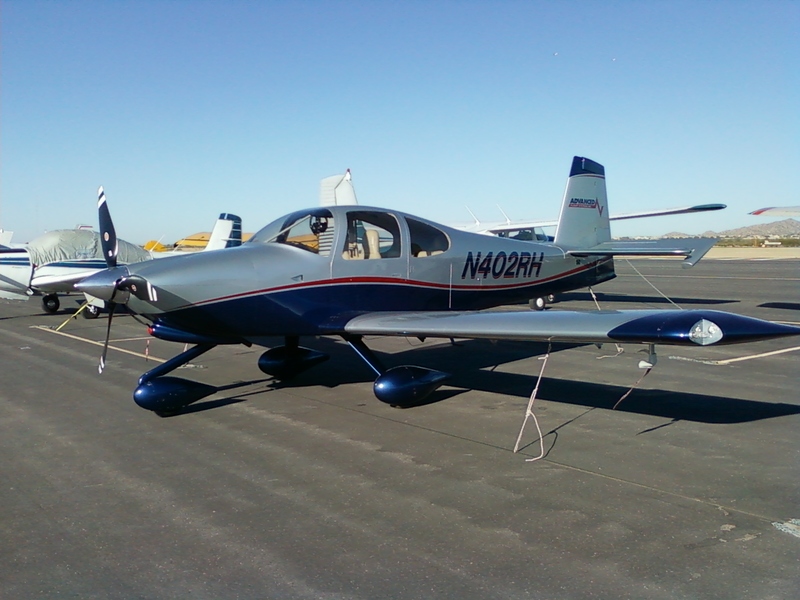 Lancair Evolution by Performance One Composites. 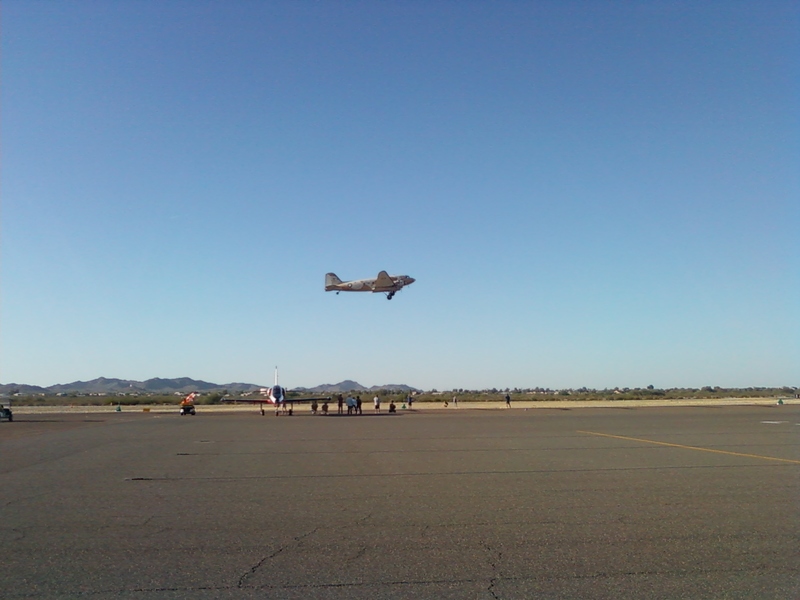 Lightning. 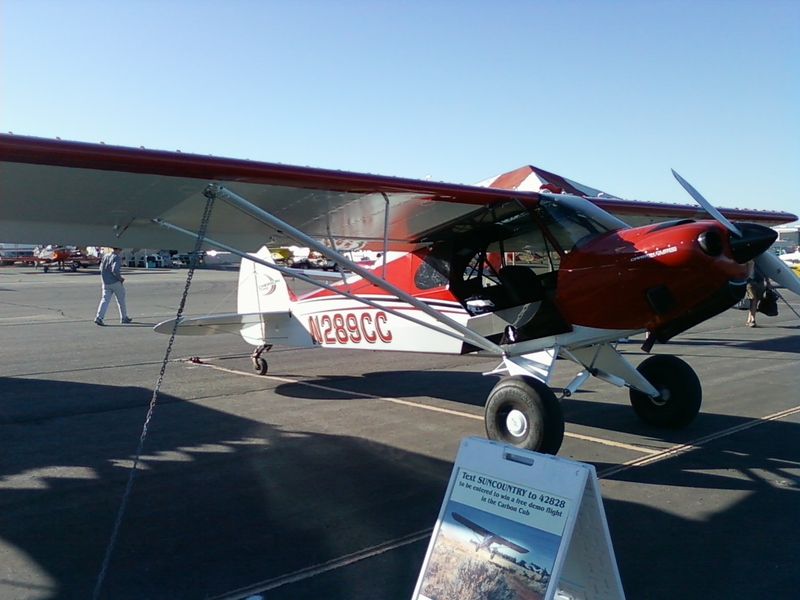 My buddy Jack was seriously injured in a crash in one of these recently. 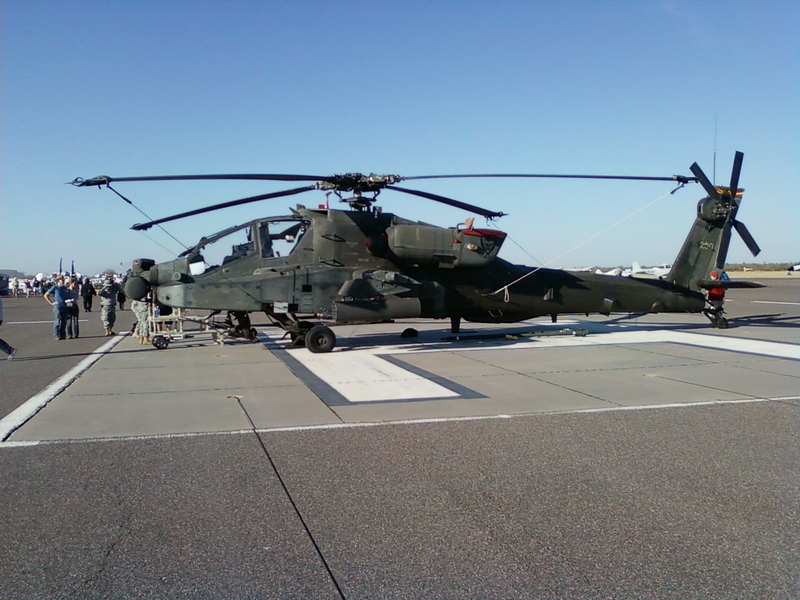 I wanted to look it over really closely. 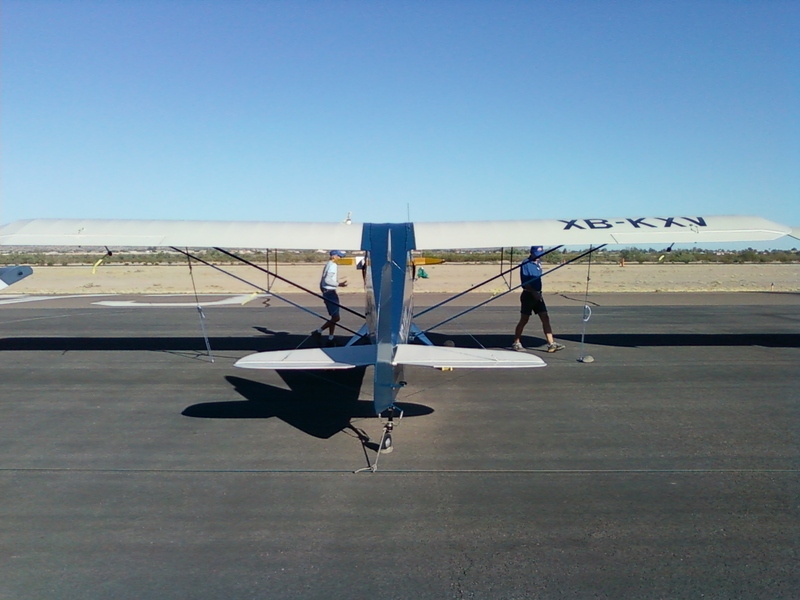 The Longbow leaving. 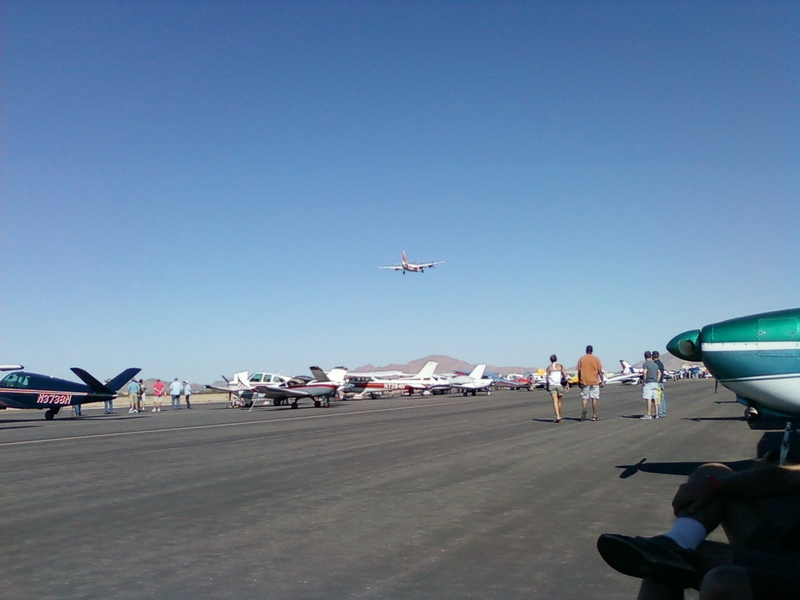 This time he stayed out over the runway! 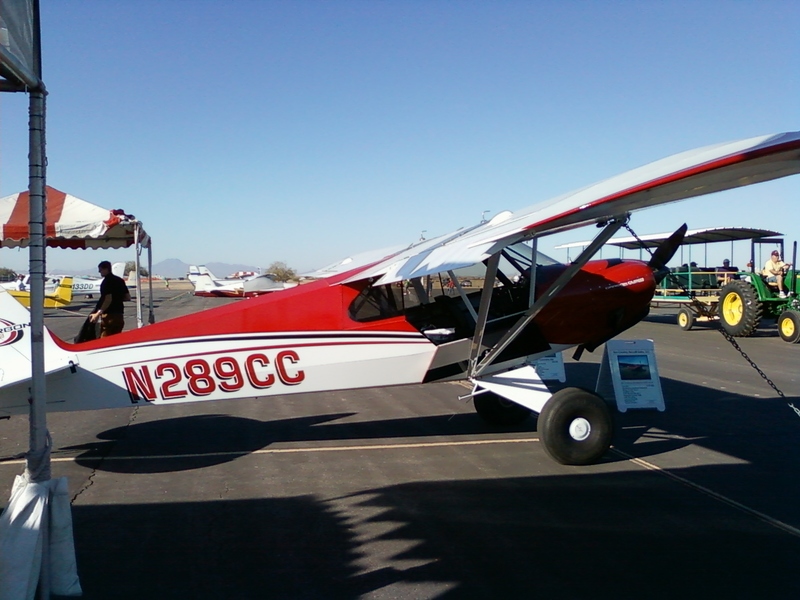 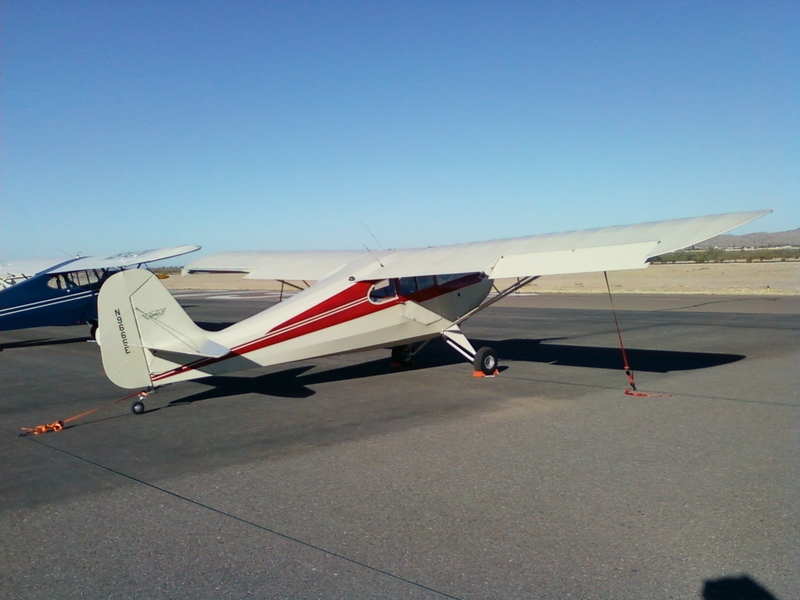 The New Standard Biplane hops another ride. 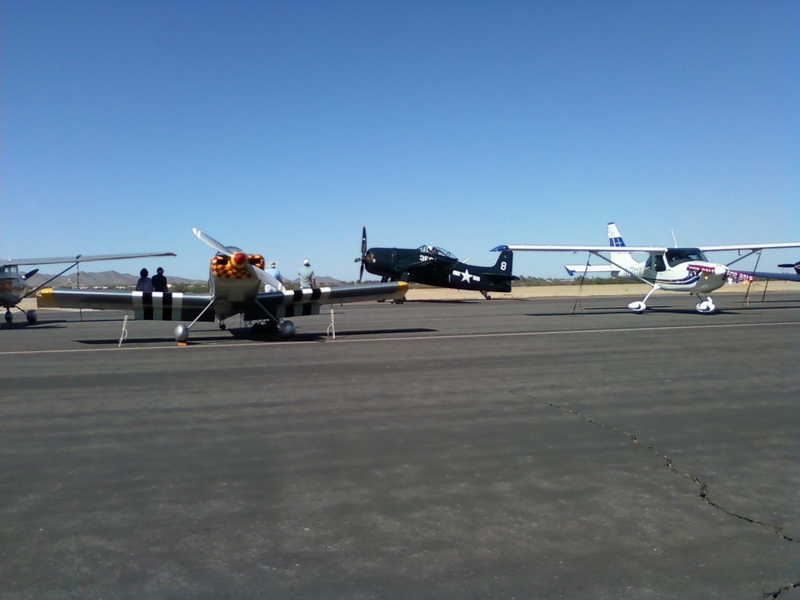 Waco Biplane and Ryan PT-22. 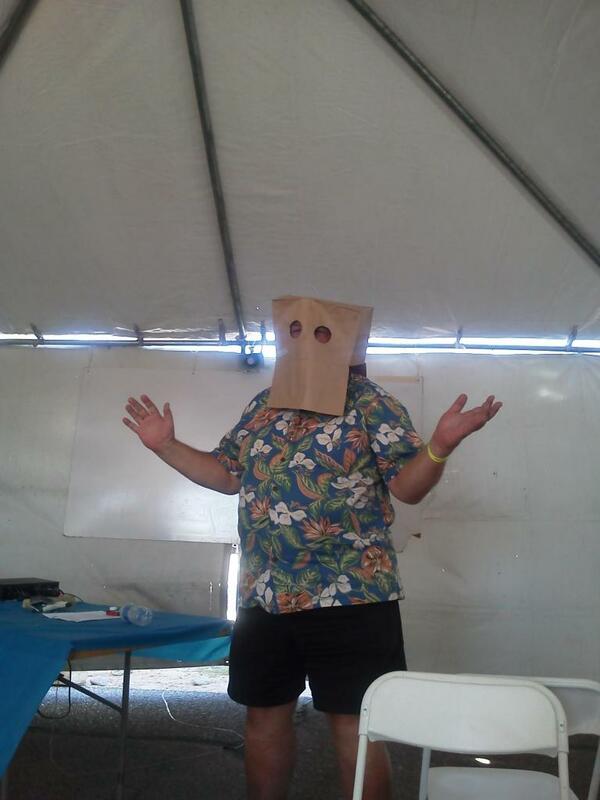 two talks in the forum tents. 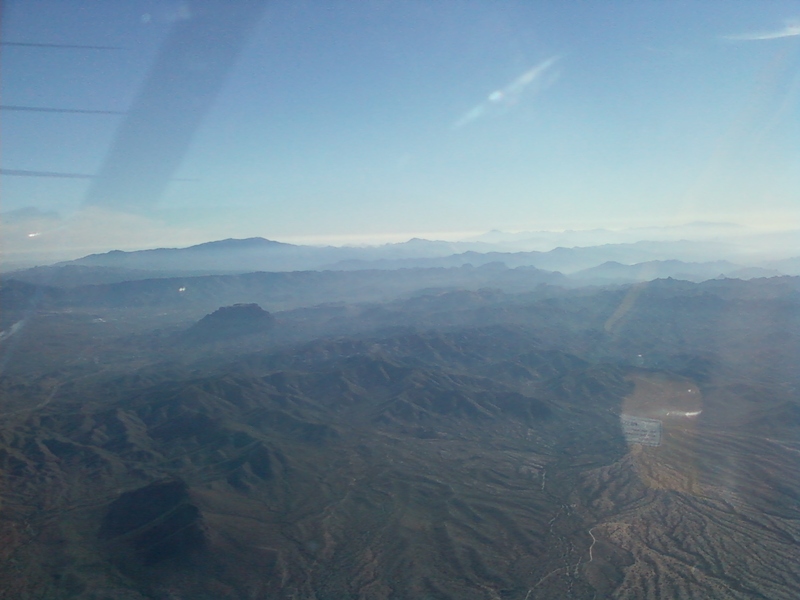 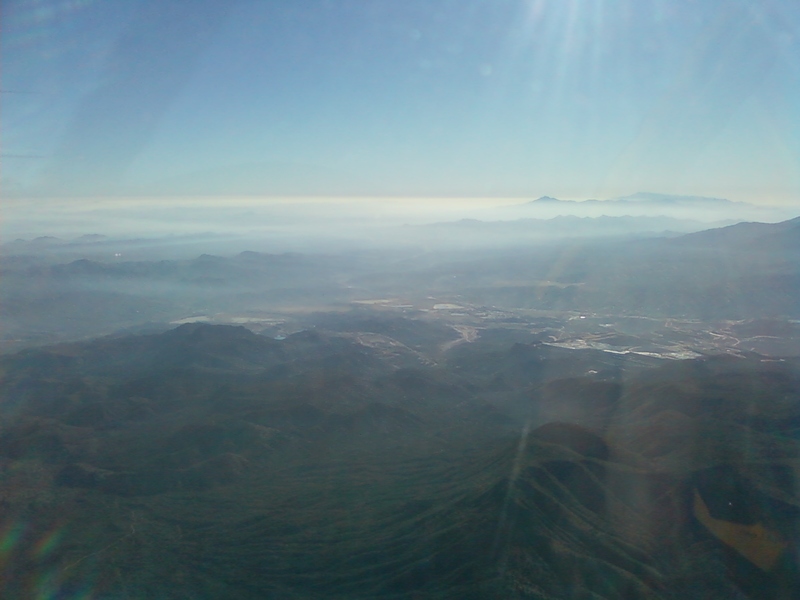 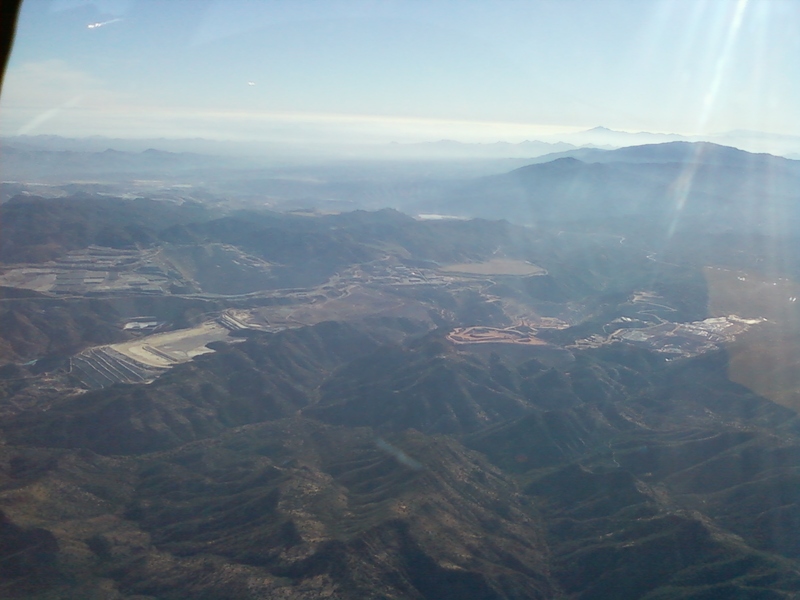 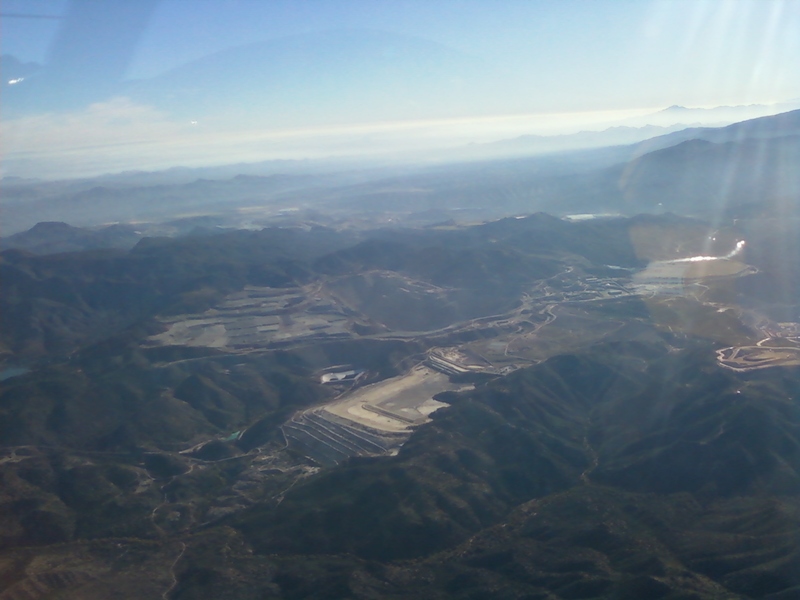 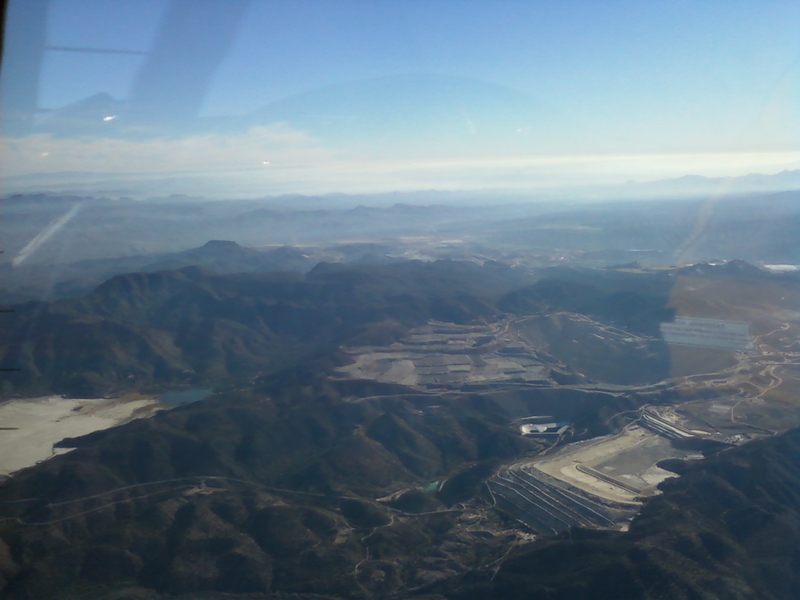 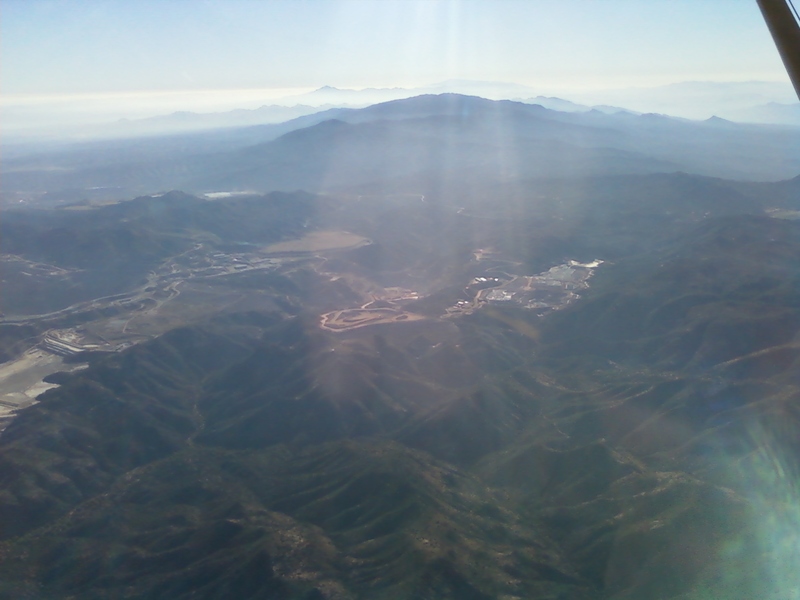 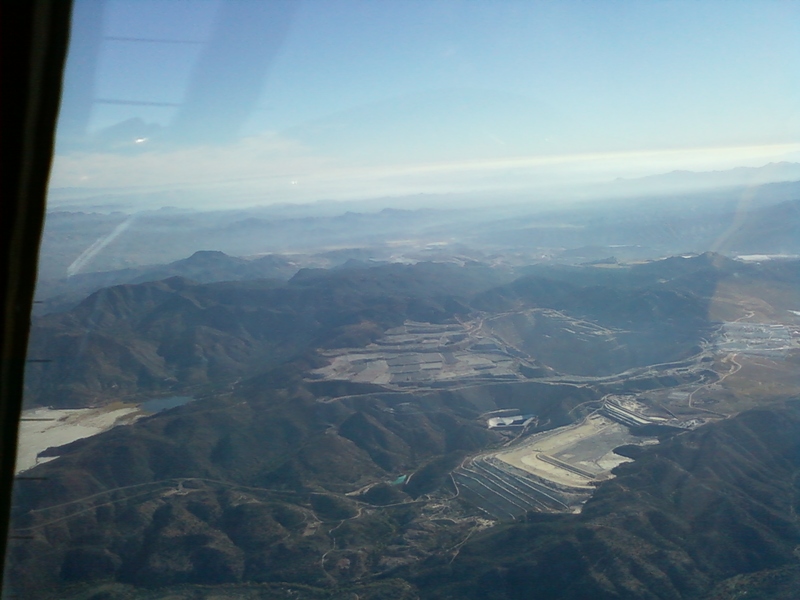 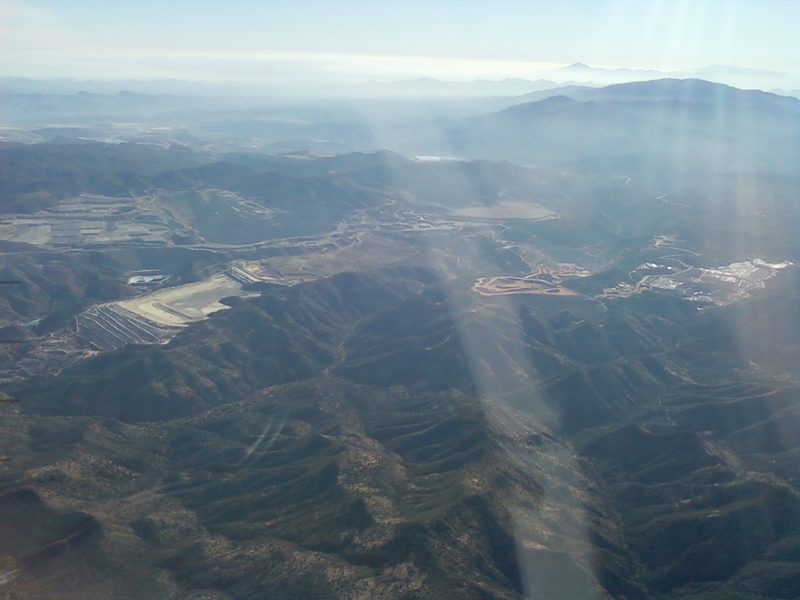 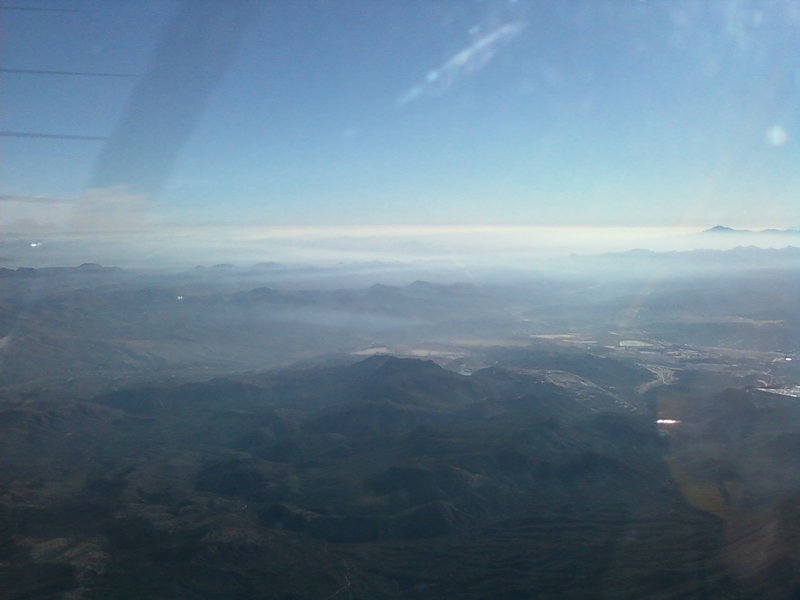 Copper Mining operations North East of Phoenix. 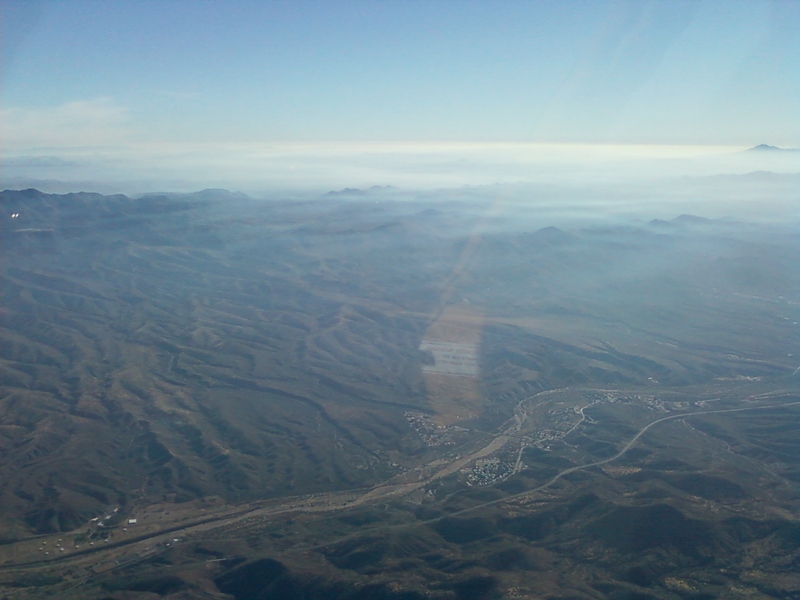 Plenty of smoke in the air, probably from Forest Service "controlled burns".